What Does an Ice Dam Signify About Your Roof? An ice dam means that your home is probably not properly insulated. Ice dams appear on some homes during the snowy winter months, usually identified by the line of icicles along the roof or hanging from the gutter. 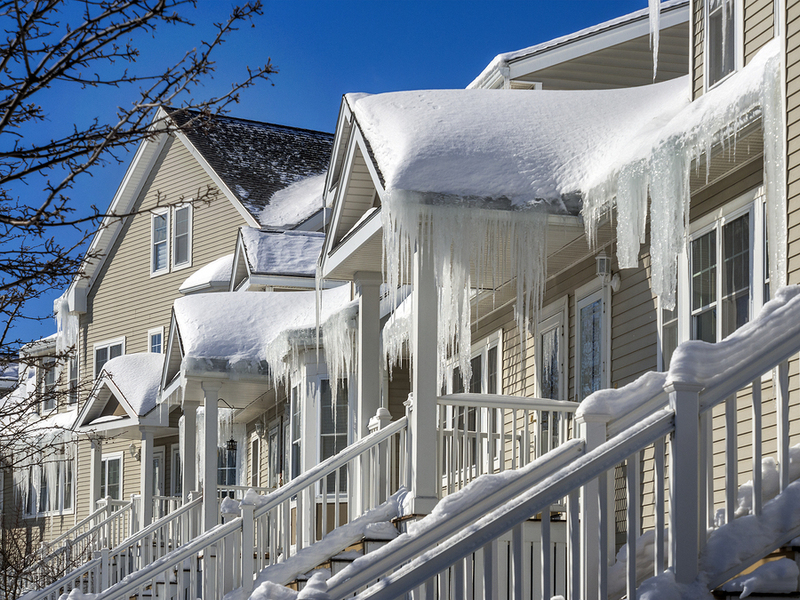 Although ice dams may look picturesque and harmless, they can actually cause damage to your home if they aren’t taken care of. The problem with ice dams is that they trap water from melting ice against the roof and eaves of the house. As gravity forces the water downward, it often penetrates the roof and causes damage to the roof and even the ceilings and walls inside the home. The only way to prevent this is to prevent ice dams from forming. When ice dams form, they signify that the house is not properly insulated. With proper roof and attic insulation, the warm air cannot escape from the house. When insulation is insufficient or absent, the roof becomes too warm, causing the snow and ice to melt, then refreeze into ice dams. Not only can ice dams cause damage to your roof and allow water to enter the home, but the icicles that form can become a hazard if they fall off the home suddenly. Furthermore, if icicles melt slowly and drip on the foundation below, water can soak in and cause foundation damage over time. It is typically not a good idea to try to remove ice dams by chopping away the ice or removing snow. Chopping and scraping can cause damage to the roof which may only make the problem worse. There’s more, the roof area is typically inaccessible without using a ladder, which can be unsafe during the winter months. Sometimes contractors can use heat to melt the ice so that the water can drain, but this is not a long-term solution. An ice dam may be along the entire roof or just concentrated in one spot. Another way to remove ice dams involves using calcium chloride ice melt (not rock salt or sodium chloride, which can damage the roof). You can put the calcium chloride into a nylon stocking and place it across the ice dam so that it melts a channel in the ice, which will allow water to drain. However, there is still the problem of accessing the roof to place the stocking, and you will need to protect any plants or shrubbery from the melting ice dam, since the calcium chloride is toxic to them. The best way to prevent ice dams is with insulation. Usually, insulation is sufficient to prevent ice dams from forming. 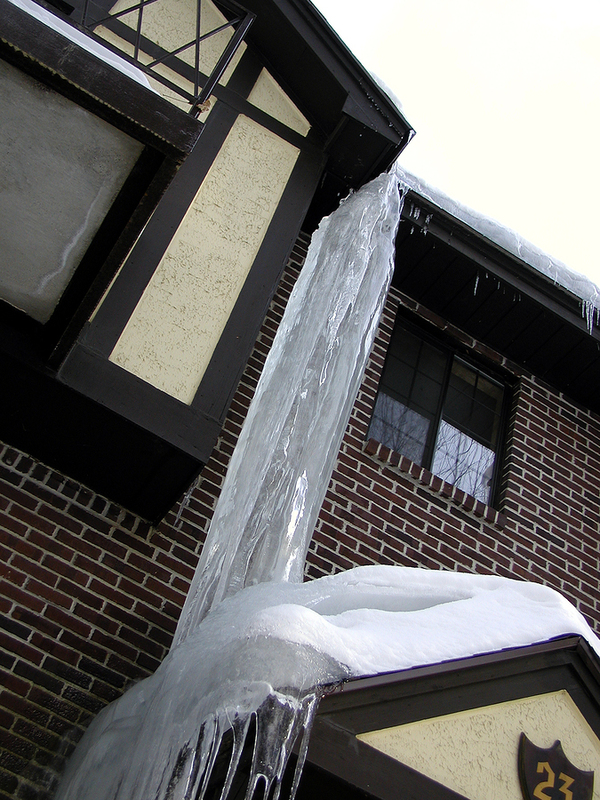 In some areas where winters are particularly fierce, heated gutters may also be used to prevent ice dams. Another advantage to heated gutters is that ice can’t clog the gutters during storms and cold spells so that water can still drain as it needs to. Moonworks can help you keep your home free of ice dams with its patented Gutter Helmet and other services. Call 1-800-975-6666 for your free consultation. This entry was posted in General Home Improvement and tagged ice dam by moonworks. Bookmark the permalink.